Today we are going to test the Audiotrak Prodigy7.1 card. Its manufacturer is known for the earlier tested previous-generation Prodigy192 and Maya44 cards. The Audiotrak trade mark covers three cards: multimedia Maya 5.1 based on the C-Media, Maya 7.1 with VIA 1616 and Sigmatel 9721 codecs and top Prodigy 7.1 based on the Envy24HT on the 8-channel 24/192 Wolfson codec. The Prodigy192 is interesting as the first multimedia sound card coming on the Envy24HT (which implies 8 channels and 192 kHz). But the Sigmatel codec which failed to be a successful solution, lack of support in games and a higher price didn't let the card to be a success. This time the Prodigy7.1 represents an entirely redesigned solution of higher quality and better functionality. It is a good pretender to be a leader in its class. The user guide in the form of a booklet is written in English and covers all required installation and utilization issues. Among the most interesting software coming on the CD are WinDVD 4.0 player, Spin Audio VST effect demo packet, demo versions of the Cubase SX sequencer and WaveLab audio editor, demo versions of Absynth, FM7 and B4Organ VST instruments from Native Instruments. No wonder that the professional applications prevail. 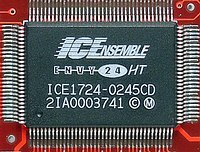 First of all, the Envy24HT processor is targeted at the professional market and supports professional low-latency interfaces. Secondly, Audiotrak is a trade mark of ESI which specializes in the sphere of pro-audio solutions. The card reminds the Terratec Aureon 7.1 Space. But they differ in the textolite color (the Aureon 7.1 is black, that is typical of Terratec devices). Also, the Prodigy has coaxial digital connectors instead of optical ones on the Aureon. The control panel consists of two tabs. Nevertheless, they include everything necessary. The main Mixer tab on the left has regulators of all existent inputs and outputs. On the right are buttons of the digital modes and sampling frequency. All the regulators except the general volume control have level indicators, but there is no separate channel regulation or balance. The input sliders have record and monitoring modes activation buttons. In the outputs window you can see a small button that turns on the headphones mode; the headphones out is combined with the front-out. The digital settings window has buttons to switch digital modes in the interfaces selected. The second tab, Advance-NSP, consists of two windows. In one window you can choose one of four possible satellite configurations. On the right DirectWire panel you can switch the channels from the MME/WDM interface into the ASIO using virtual cables. The Launch NSP button invokes a special drivers' feature called Native Sound Processor. Here you can apply any VST effect to any input/output in the real time mode without using the VST sequencer. Users who are not that skilled can apply professional effects themselves, the demo packet supplied with the card has enough of them. The manufacturer thus makes up for lacking hardware sound processing with the card's processor for those who like to turn knobs to add unusual effects or for using the PC as an effect processor. Speaking of the gaming features, the Prodigy 7.1 supports the Sensaura algorithm activation, but it's different from the traditional way used since the Terratec 6fire when Sensaura can be enabled in the card's control panel. There is no such option in this control panel. 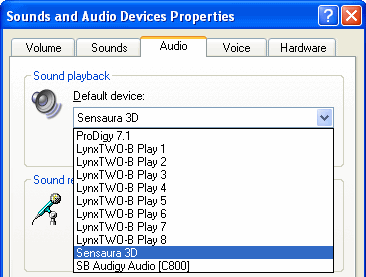 To enable the Sensaura in games you must select the Sensaura 3D virtual device in the Windows active audio device panel. The Prodigy 7.1 should be used for playing music and for professional applications. On one hand, such implementation looks complicated. On the other hand, you can forcedly set a required device in all professional applications leaving the Sensaura 3D for games, that is why you probably won't have to reswitch the default device that often. Now, when we have looked through the control panel, let's proceed to the tests. The card was measured with the reference card Lynx Two (117 dB SNR). A short low-noise microphone cable, Proel, with gold-plated connectors was used to connect the cards. The input sensitivity of the Lynx Two is standard: -10 dB V. Note that the Prodigy 7.1 follows the signal level standards. The detailed results for the front output for 16 bits 44 kHz are here. Since the hardware filling is the same, the scores are similar to those of the Terratec Aureon 7.1 Space. The detailed results for the front output for 16 bits 48 kHz are here. The detailed results for the front output for 24 bits 96 kHz are here. The detailed results for the front output for 24 bits 192 kHz are here. The detailed results for the line-in for 16 bits 44 kHz are here. The Lynx Two card was used as a signal receiver. On the built-in frequency meter it proved to be complied to the standard value of 44100 Hz, which is often too expensive for multimedia audio cards. The detailed results for the digital-out for 16 bits 44 kHz are here. All previously tested cards with the Sensaura algorithms had no more than 32 buffers. 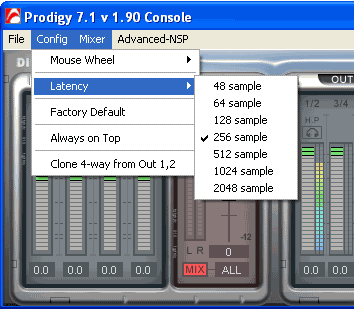 The Audiotrak Prodigy 7.1 utilizes all of 64 buffers due to the newer Sensaura algorithms while similar cards from Terratec and M-Audio have the old file version of 2002. We certainly tried to replace the files for the similar Aureon Space 7.1 card, the but they didn't match. In the subjective tests we will find out whether the difference can be heard. Windows XP SP1, DirectX8.1, Athlon XP 2100+, KT333, DDR333. CPU load (%) is given for different modes of operation and for a different number of DirectSound buffers. The average value and dispersion go after the slash (mean of distribution and standard deviation) for the 2-minute test and with accidental releases of the system discounted (swap etc.). Our hero demonstrates a lower CPU load than the M-Audio Revolution 7.1 and an approximately equal one to the Terratec Aureon 7.1 Space. But the scores of the Audigy2 remain the best. The Audiotrak Prodigy 7.1 card perfectly works in the Cubase SX audio/midi sequencer in all modes available. In the Control Panel in the Config option you can select a buffer size to optimize latency. The Event 20/20bas active monitors were used in the comparison tests. Sound quality was compared to the Creative Audigy2 and Terratec Aureon 7.1 Space cards. Since the sound produced by the Aureon 7.1 is indistinguishable from that of the M-Audio Revolution 7.1, we can consider that the latter also goes through our tests. After we listened to various audio compositions several times we came to the conclusion that the card in question and the Terratec Aureon 7.1 Space have the same sound. But that was expected. As to the Audigy2, the card plays differently in different compositions, and it's difficult to say which one looks better. We included the Lynx Two card into the tests to reveal which one is closer to the ideal. It turned out that the Audiotrak Prodigy 7.1 plays a bit more closer to the Lynx Two. But it's impossible to catch the difference with inexpensive PC speakers. Unfortunately, quality of even expensive miniature PC acoustic systems priced at around $400 doesn't match modern sound cards priced at $150. If you prefer high-quality sound, forget about PC speakers and consider pro-audio acoustics or brand-name magnetically shielded consumer electronic speakers. These benchmarks tend to show approximately equal scores in all latest tests. The previously tested cards based on the Envy24/Envy24HT and supporting Sensaura 3D sound play equally. To be more precise, they fall behind the Audigy2's sound quality by the same margin. The Audiotrak Prodigy 7.1 sounds a little better than its Envy24HT counterparts due to the advanced Sensaura algorithms, but it's still far from the Audigy2. Positioning of the nearest sources is realized better in the Prodigy 7.1, and a large number of streams reproduced simultaneously doesn't cause drops or flaws. It's obvious that the Sensaura algorithms were improved primarily in the zone nearest to the listener. But as compared to the Audigy2, the Prodigy 7.1 and other similar cards have colorless and blurred sound. First of all, it refers to samples used in game scenes. High frequencies are not entirely reproduced, and some are even distorted, which makes the sound a bit hoarse. Secondly, the Audigy2 has a good localization of all sources used. For example, in certain scenes in the UT2003 you can easily find out where the enemy is located (by his steps and by sound of weapons) and where missiles blow up. With the Prodigy 7.1 such sounds are often very quiet and can be heard from everywhere. 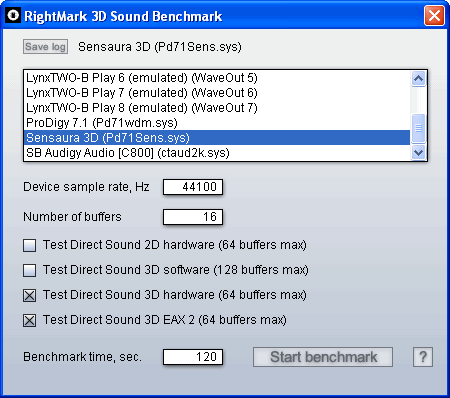 Nevertheless, if we compare it with the software implementation of the DirectSound3D+EAX in the drivers of the integrated AC'97 sound in the Realtek ALC650, the cards supporting the Sensaura algorithms look a real breakthrough! To test the Headphones-out (or the Headphones preset realization) we used the Senheiser HD600 headphones. The signal level is quite high, clear and undistorted even at the maximum volume level. 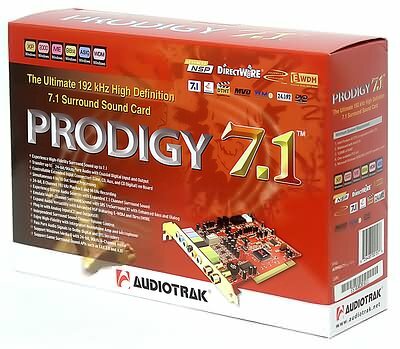 The Audiotrak Prodigy 7.1 sound card based on the Envy24HT chip with the Wolfson 8-channel codec is a good solution for music listening and playback of DVD movies, as well as for professional applications for music composing in entry-level home studios. 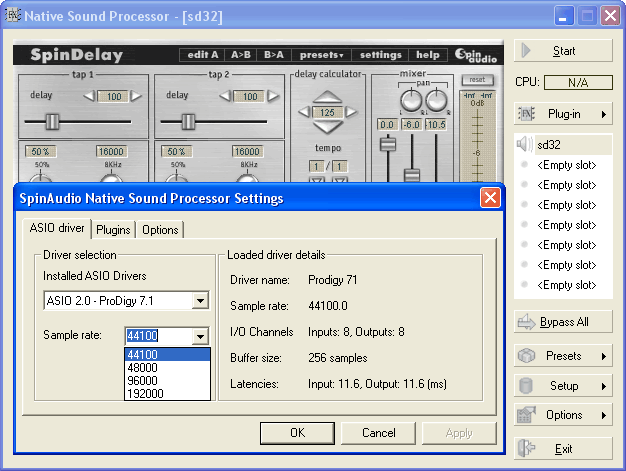 The NSP (Native Sound Processor) can apply VST plugins to the card's inputs and outputs, that makes up for a hardware effect processor. The sound quality in music corresponds to that of professional audio cards of the same category. Although there are not surprises, there are no disappointing angles as well. 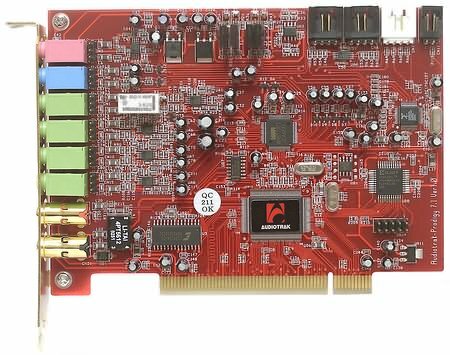 In gaming applications this card is superior to other identical Envy24HT based cards with the Sensaura 3D sound because of the updated algorithms. 3D sound quality inferior to the Creative Audigy2. We have prepared for our readers an interview with technical expert Nikki Kang from ESI/Audiotrak who kindly agreed to answer our tricky questions. iXBT.com: What about the 24/192 and 24/96 formats in the real life? As we know, the latest WinDVD version supports 24/96 PCM only for the DVD-Video. Is there any news concerning the DVD-Audio support in software DVD players? NK: We have heard that InterVideo plans on the DVD-Audio support and they are working on it now. Also, Japanese company Digion works on a software DVD-Audio player. As we know, they both have developed such players and now are trying to get the license and protect the contents. By the way, beside the DVD-Audio and SACD there are excellent DTS discs and 24/96 DVD-Video audio discs. For example, http://www.aixrecords.com/ - Mark Waldrep is one of the pioneers of DVD-Video media with high-resolution audio; http://www.hiresmusic.com/ contains a fairly good collection of DVD-Video 24/96; http://www.chesky.com/ has a good range of DVD-Video 24/96 etc. iXBT.com: What speaker sets would you recommend for the Prodigy7.1? Have you ever seen 7.1 PC speakers? NK: We've got excellent Tornado 7.1 speaker set on our local market, and we plan on selling it all throuout the world at $199. You can also buy them online at $299 in our shop. Here you can find more information on these speakers. iXBT.com: The Prodigy7.1 audio card sports excellent DACs but ordinary PC speakers have terrible sound. It can be a good idea to offer good speakers for users. Do you plan on that? I don't mean semiprofessional near-field monitors, but the price range of $100-200. NK: We agree that most PC speakers don't have good sound. Even the Tornado speakers are not that good as professional near-field monitors. At the moment we recommend Altec 621, 641 and Klipsch ProMedia 5.1 speakers for the Prodigy. We are also going to develop speakers with 3" wideband loudspeakers at the price of $100 as a stereo acoustic system. Most probably, we will bring out a trial lot first. iXBT.com: On the market one can find several models of the Envy based cards from different manufacturers. They certainly differ in the drivers, but the hardware section is of the same class; as to music playback, they all belong to the sub$250 category. We don't notice any difference between these cards but our reference Lynx Two has markedly better sound. Do you have any plans for a card with higher-quality DACs than in the pretty good Prodigy7.1 and which will be meant for music lovers rather than for professionals? NK: Thank you for the question. We are currently developing a product named EX8000. This is a device for a rack mount rather than a card. Its quality is comparable to the Lynx Two, but it's not for average users. We are thinking over a consumer version, but we haven't started developing it yet.